It's a new year, and usually that means trying new things! I want to introduce you to some unexpected color combos, and I dare you to try them. Some of these might not seem super crazy, but they're combos I haven't seen a lot of, so I want to publicize them further. 2012 was a year of bold fashion statements, I think 2013 will push the envelope even more. I challenge you to step outside your comfort zone of black and white. Army Green and Hot Pink is a color combo I have been mediating on a lot lately. I don't know where I first saw it, but I knew it was so wrong it had to be right. I love the idea of mixing a muddy, masculine color with a frilly pink. This is one of the few ways I would consider wearing a hot pink dress! I would also utilize gold accessories, because I think, It compliments this color palette better than silver. There was a point when I thought black and brown was the worst color combination one could imagine. But I've had a change of heart (for the moment). Perhaps it's my love of leopard in which I am willing to allow these two hues to coexist in one outfit. Nevertheless, I am very much into wearing my tan boots with my black skinnies this season. I don't condone chocolate brown with black, but tan, beige, cognac, and caramel will all get my nod of approval. Mint and Coral should be of no surprise to you. These were practically the "spokes-colors" for 2012. Both of these shades will be big in spring and summer again too! Don't be afraid to mix them, just remember to keep your accessories neutral. Burgundy (aka Oxblood, if you want to be trendy with your words) and Cream is another predictable combo, but why haven't I seen more of it? Every blogger is going crazy over the "oxblood" trend, but I prefer to pair this shade with a more delicate hue. I like the softness of the cream against the deep rich red. And, you can never go wrong with a gold sequin skirt! Okay, so maybe "leopard" isn't exactly a color, but my girlfriend dubbed it a neutral this past year, so I'm gonna go with that. I'm very big on pairing emerald green and leopard this year. Emerald is after all the Pantone color of 2013, so I'm going to try to work it into every combo I can. Last but not least is mustard and navy. I'm pretty sure Taylor Swift is single-handedly putting mustard on the map, but if you're not Taylor, it can be a difficult color to wear. I like the idea of wearing mustard with navy and using other rich earth tones (like burgundy) to finish off the look. I hope I have inspired you to go outside your color comfort zone in 2013. And if you have any other wacky combos, I'd love to hear about them!! Army and hot pink has long been a favorite of mine (I call it olive and fuchsia, but I think we're talking about the same thing). 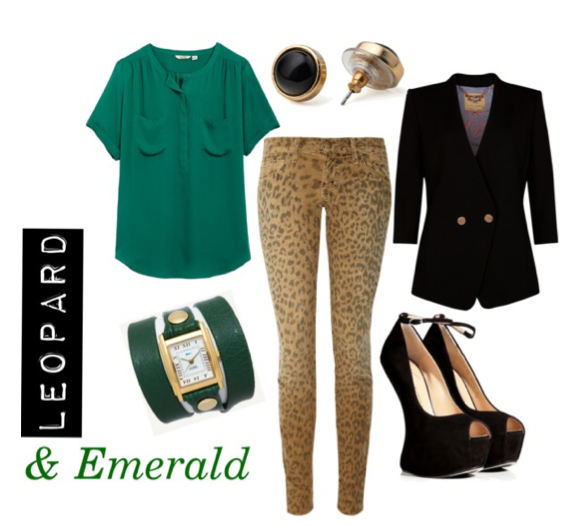 I love green with leopard and will definitely try emerald and leopard. Really, the only color combination I don't think I'll try is mint and coral. 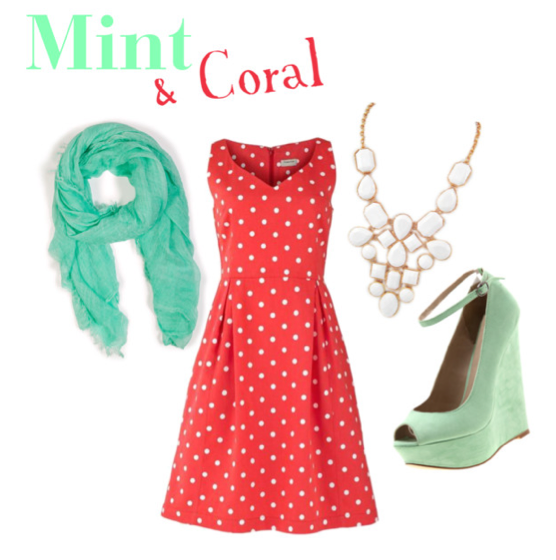 I love coral, but I absolutely don't wear mint. I'm totally excited to add some emerald to my closet!! Excited to throw in some army green & hot pink into my life this year! Hope you are having a great 2013 so far! I know all those color combos. Yay me. But I do like that you are introducing them to the world. I am sure that this year fashion will be crazy, but in a good way. I am excited to see what comes. LOVE all the color combos. The pink with the army green is something I never really considered but seeing them together really makes me want to put the colors together!! I wore mustard and navy yesterday on my blog. It's probably my favorite color combo!! Thanks for stopping by my blog and for your lovely comment! Mint and coral are my favourite colours to pair! I love emerald and royal purple too! I am also sometimes a little hesitant to pair black and brown together. Navy and mustard is one of my favorite color combos. Thanks for linking up! I haven't worn army green with hot pink, might have to try! I also love gray with lavender, burgundy with cobalt, and black with tan. So many color combos to try! I once read that Diane von Furstenberg called leopard print a neutral, and ever since, I'm a believer! Happy new year Tori! Now, these are some combinations to try, thanks for the inspiration!